Well, it’s time to draw the winner of the latest book giveaway, for a copy of Alex Skovron’s Autographs! The 56 prose-poems that make up this collection explore provinces of the self – time and the allure of memory, the mosaics and masks of identity, fantasy’s realms, eros and the affections, the will to imagination, our shifting perspectives on ‘reality’. We visit mythical lands and real cities – including Venice, Jerusalem, Katowice, and the Sydney of the author’s youth – lightly stepping across continents and delving into assorted time-frames. Skovron catches meanings lurking at the edges of (un)consciousness, exploring the actual and the surreal, faith and self-knowledge, destiny, relationship, personal histories and obsessions. His reach, however, extends beyond past, present and future. Touching on contemporary issues (say terrorism, alienation, global conflict), he transcends them and transforms … sometimes evincing deep feeling, at other times apparent irony and detachment. Everyday scenes are transfigured with oblique qualifiers and sudden sleights of hand. Words fly off, now in fresh coinages, now mysteriously yoked together, but behind the illusions of randomness is a controlling and masterful sensibility. Of especial interest to the author are the poetic dimensions and musical possibilities of prose. While the order of the pieces across the book’s three sections has been carefully plotted, they all stand as self-contained compositions linked, sometimes, by recurring motifs and echoes from one voice to another. 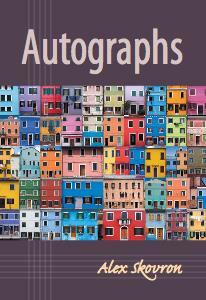 Autographs is a book of many voices – and of the many signatures that underwrite our times. An earlier version of Autographs was awarded the Wesley Michel Wright Prize for Poetry in 2005, and in the following year was shortlisted for the Alec Bolton Prize for an unpublished manuscript. Alex Skovron is the author of four books of poetry, most recently The Man and the Map (2003), and a prose novella, The Poet (2005). He has won a number of major awards, including the Wesley Michel Wright Prize for Poetry (twice), the John Shaw Neilson Poetry Award (twice), the Australian Book Review Poetry Prize, and, for his first collection, the Anne Elder and Mary Gilmore awards. His novella was joint winner of the FAW Christina Stead Award for fiction. Born in Poland, Skovron lived briefly in Israel and came to Australia at age nine. He grew up in Sydney, moved to Melbourne, and works as a freelance editor. Autographs is published by Hybrid Publishers. ISBN: 9781876462604; Pages: 72. It’s available from Fishpond: Autographs or direct from Hybrid Publishers. And the winner is *drumroll* No 2, Evan! So Evan, you need to contact me before July 15th with a postal address for me to pass on to Hybrid Publishers who will then post the book on to you. (I’ll redraw the giveaway if the deadline isn’t met). You can find my email address in the RHS menu right at the bottom of the blog in the yada-yada about copyright. Now, don’t get despondent if you didn’t win because I have two more gorgeous books from Hybrid to give away over this coming month. So make sure you are subscribed to this blog so that you don’t miss out on knowing about it.